In new version we reworked report objects architecture this allows us add new objects with new features! 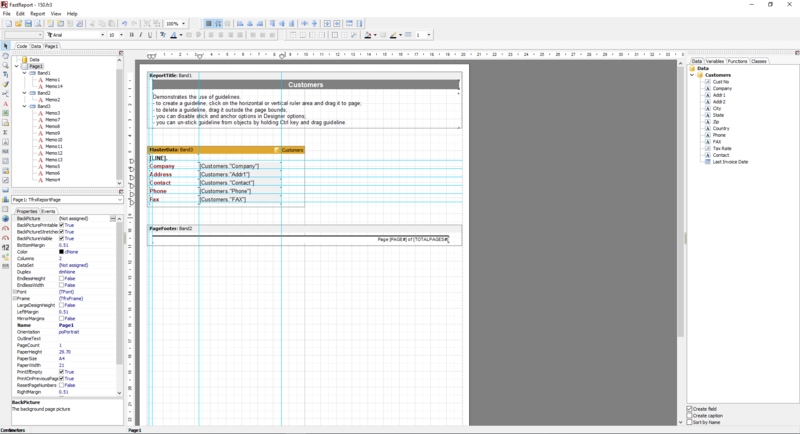 New architecture allows to build complicated interactive reports and complicated objects editors which can be used in both the report designer and preview. With new object editors users can edit some objects of prepared report with the report designer. Expressions post processing in «Text» objects. New post processing gives ability to calculate expressions inside text objects(and others) by some event (group ending, for example) with delay . This mechanism allows to show aggregate functions like Sum at the report beggining before total value will be calculated without any script code and just for one data pass. New duplicates proccessing. With new duplicates processing system it's easy to combine dublicate «Text» objects. It's possible to clear duplicated text like it was before, but also to hide objects with same text and even join several «Text» objects in one. Transport input-output filters. 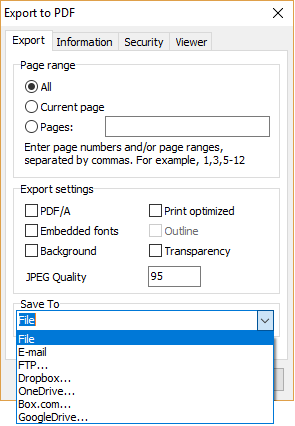 New intermediate layer between Save and Load file operations gives user ability easily save and load report templates or prepared reports. Also it allows to save export files to different files storage or send it by e-mail. With new version is easy to save report templates, prepared reports or exported results to different places like clouds services or send it by e-mail. Delphi's component model allows to include filters to application easily. With component model it's easy to add and control transports in your application. FastReport VCL supports these storage: E-mail, FTP, DropBox, OneDrive, Box.com, GoogleDrive. The Table object allows you to build a tabular report with variable number of rows and/or columns. 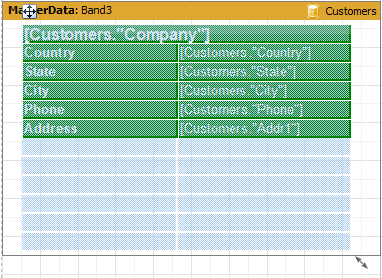 With this object it possible to build complicated tabular reports which does not have frame overlapping. 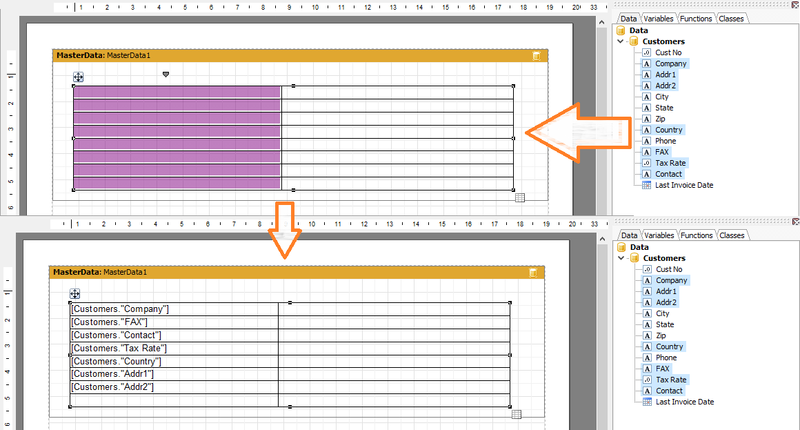 But, first of all Table designed to make report creation fast and easy. It has rich functionality to manipulate with table appearance like adding of new Row and Columns, change Row/Column places, join cells, set table dimensions easily, change Row/Column sizes and link cells with data. Just like “Text” object Table can grow and split. New «Map» Object. You can add geographical maps to your report. 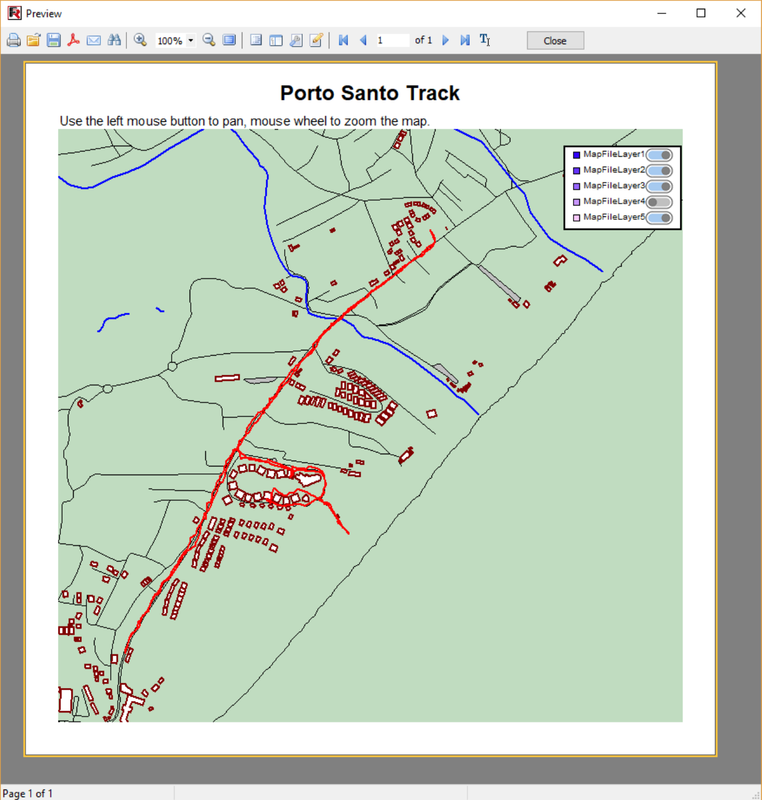 The Map Objects supports different maps formats like OSM and ESRI. It has rich abilities like color ranges, highlights, GPX, interactivity and more. 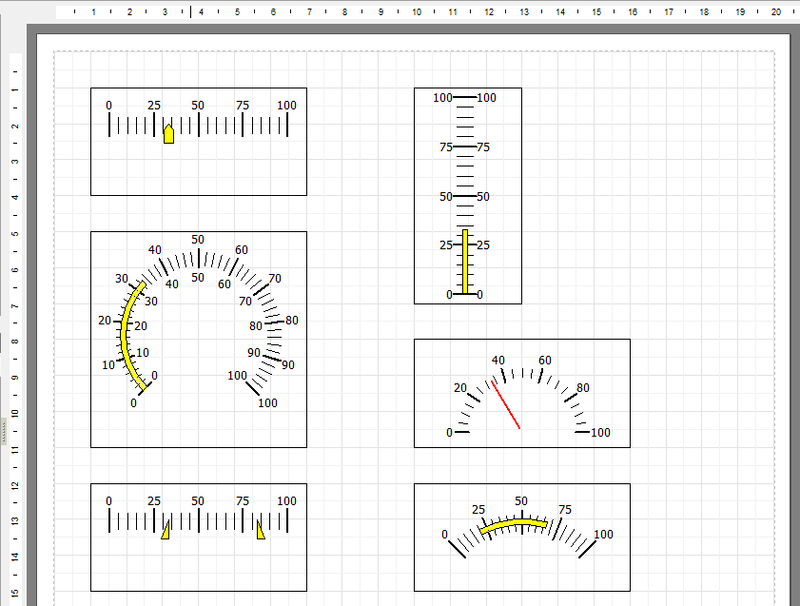 Gauge object. Add more visual representability and interactivity to the report with new different types of Gauges (interval, linear, radiant and more). 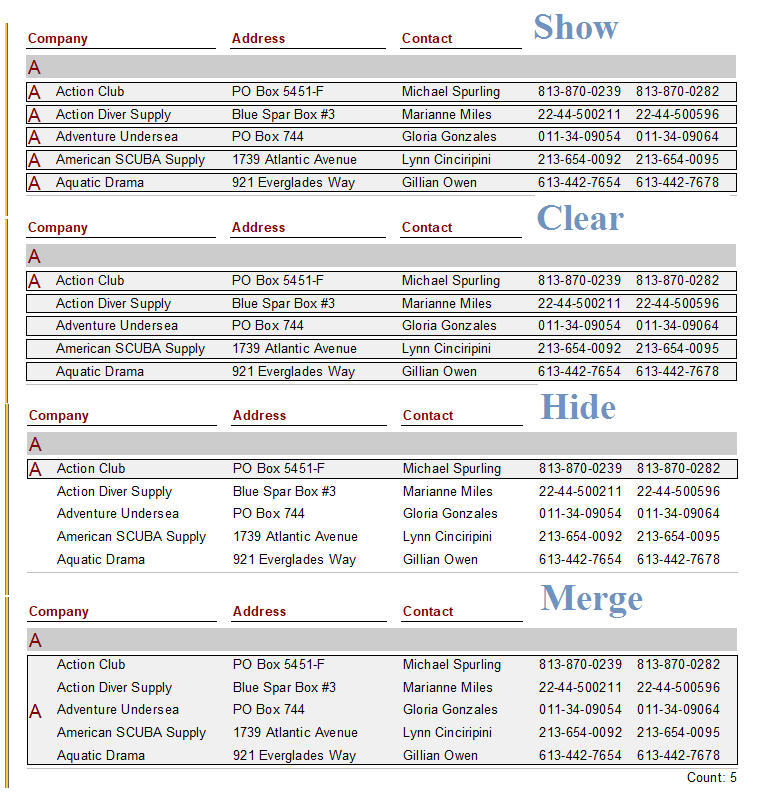 New barcode types for barcode object Aztec code, MaxiCode and USPS can be used inside the report. 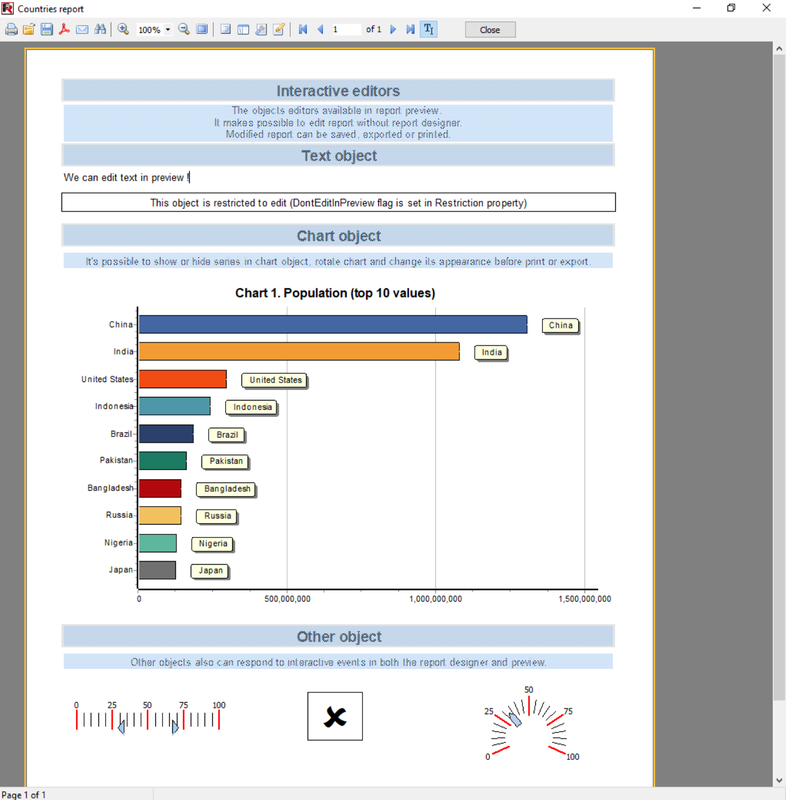 New export filters abilities for PDF, SVG, HTML5 allow to process complicated objects like RichText, Chart, Maps and exports them directly as vector/text format approaching WYSIWYG in these formats. Improved Guide lines allows to move and resize docked objects. It makes editing of the report easier. 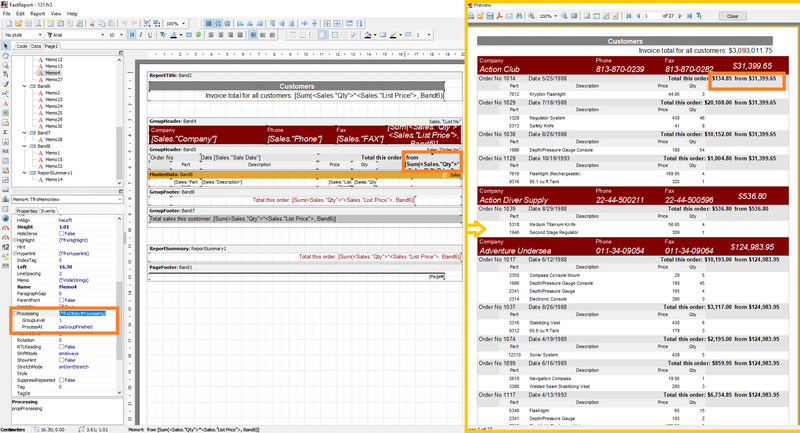 User's can set up Guide lines functionality in report designer options. Extended script debugger. Improved break points with ability to temporary disable it and set condition for triggering. New window with “Local” variables list.